Still hoping to help the bunnies find their lost eggs? (if any) are available for that day! Day of tickets can only be purchased in person at the Easter Bunny Office for the same day. Same day tickets are available on a first come first basis. Day of tickets can be purchased using cash, Debit, Visa or MasterCard. Easter Egg Hunts are Rain or Shine! Please come dress appropriately for the weather! Note: Please ensure you allocate enough travel time to arrive at least 30 minutes prior to your reserved time as the tractor drawn wagons leave promptly at your designated time! If you miss your wagon, you miss your Easter Egg Hunt. There are no refunds or exchanges for missed wagons or late arrivals. Due to safety concerns, no walkers, wheelchairs, wagons, sleighs or strollers are permitted on the ride. 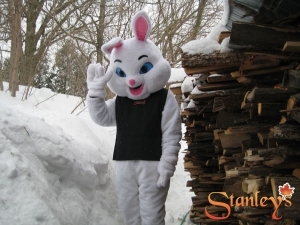 Children and adults alike delight in meeting the Easter Bunny and helping him find his eggs. Pile aboard the wagon for a ride out to the Sugarbush. Hunt through the bush in search of the Easter bunny’s lost eggs, and add them to your basket. Soon we’ll dump them all into the Bunny’s Giant Basket and head back to visit the baby animals in the barn. Family fun for all – and each child leaves with something special! The Easter Egg Hunt is extremely popular, and sells out every year! Due to this fact once tickets have been purchased all dates & times are final. Tickets are non-exchangeable and non-refundable. Please be sure of the date & time chosen prior to finalizing your purchase. If you are no longer able to attend – tickets are transferable to a third party, however original proof of purchase is required. Children under 18 months do not require a ticket and will not receive a gift from the bunnies. Note: Please ensure you allocate enough travel time to arrive at least 30 minutes prior to your reserved time as the tractor drawn wagons leave promptly at your designated time! There are no refunds or exchanges for missed wagons or late arrivals. We also recommend appropriate footwear & outerwear for the entire family, spring conditions in the bush are unpredictable. **Be assured that we will respect your privacy. Your e-mail address will not be used for any other purpose, or passed on to any other organization or individual. Mobile Devices (Smartphones, tablets, ipods etc) – For security purposes only Paypal is accepted when booking through a mobile device. Desktop or laptop – All Major Credit Cards & Paypal are accepted when booking through a desktop or laptop computer.